I did not follow Century Logistics group all this while. But since it just released its latest annual report and I thought it may benefit from the lower cost of petrol, so I decided to take a look. At first glance, it looked good. Everything was improving. Nothing is better than that. However, when looking at its income statement and cash flow statement, one may not find it hard to notice that there were actually gain of asset disposal as well as fair value gain on its investment property being recorded in FY2014. Management mentioned it too at the chairman statement. To me, the transparency is good as they separate it out individually and clearly for these one off gain as to some companies, they would put under "Other Income" section. For that case, one need to zoom down to the operating cash flow section for confirmation. Yes, they disposed its plant in Thailand and Port Klang last year. Total one off gain for FY2014 was around RM17 million. If deduct the one off gain, the PBT would be RM42.4 - RM17.1 = RM25.3 million. 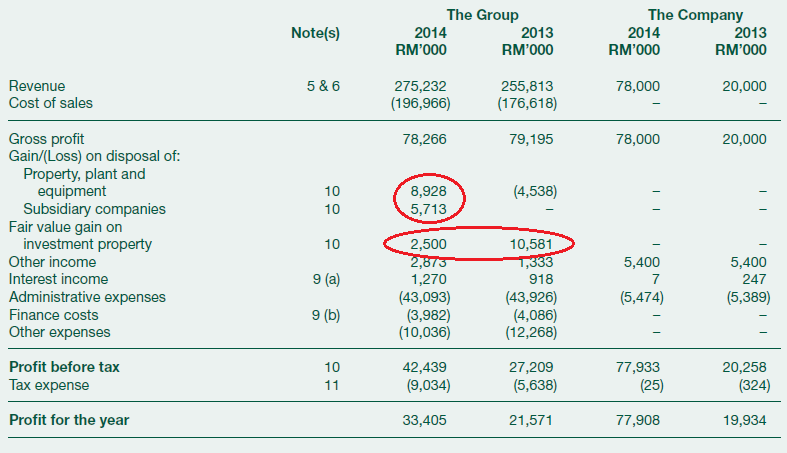 It's still higher than FY2013 as there was a fair value gain of RM10.5 million recorded in FY2013 too. EPS for FY2014 would be RM19 million / 365,019 = RM5.2 cents. Based on closing price of RM0.825, PE would be around 16. There was some growth prospect in the group like net cash for the first time, new multi-storey warehouse in Klang that expected to commence at the end of 2015 and higher contracts from MNC in PTP warehouses. I think the price is little bit fully-valued already. Limited upside. But wait, a technically breakout from long term down trend with high volume? But I'm not a good chartist technician.